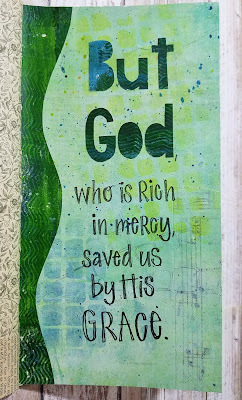 " But God, being rich in mercy, because of the great love with which he loved us, even when we were dead in our trespasses, made us alive together with Christ—by grace you have been saved— and raised us up with him and seated us with him in the heavenly places in Christ Jesus, so that in the coming ages he might show the immeasurable riches of his grace in kindness toward us in Christ Jesus. For by grace you have been saved through faith. And this is not your own doing; it is the gift of God, not a result of works, so that no one may boast." These words lead us to God's intervening grace throughout the Scriptures. The beginning of Ephesians chapter 2 reminds us of our state without God - "You were dead in your transgressions and sin". Then, verse 4 opens up to remind us of the words that are at the very heart of the Gospel - But God. Let me paraphrase the beginning of today's passage: "But God, who is rich in mercy, because of His great love for us, made us alive with Christ - it is by His grace we have been saved. " The Greek word order shows us that we are saved first, because of God's mercy, and second because of His great love for us. God is rich in mercy because of His great love. His mercy and His love lead Him to act in grace. In His grace He saved us, He made us alive with Christ, He raised us up with Him, and seated us with Him in the heavenly realms. This is the Resurrection Life! It is the life we live in spiritual union with Christ! God made us alive with Christ, raised us with Him, and seated us in the heavenly realms with Him in order to show the riches of His grace seen in His kindness to us in Christ Jesus. And thus, it is by grace He has saved us; not by ourselves or by any works we could do. Our salvation is a gift of God. A gift that we receive by faith in Christ. I just love this passage in Ephesians 2, as well as our other reading today in Romans 3:21-24. A reminder of God's mercy and love for us expressed in His grace to us through Jesus Christ is a great way to begin Holy Week.